Isabella is a partner at a North London accountancy firm. She grew up in a typical working class Jewish family, and remembers experiencing gender dysphoria at an early age. It was only in her 50s that she took steps to begin her transition from male to female. Her body now matches her mind and she feels comfortable with herself. “It’s important to be aware that you don’t have to lose religion and faith when you come out as trans. I think one of the ways I live my life is being true to myself. If you’re struggling, be true to yourself and enjoy the journey. 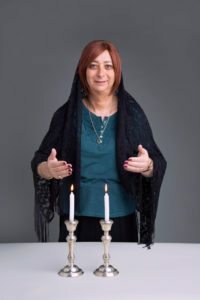 One of my big fears when I transitioned was that I would lose my Jewish identity. Thankfully, I haven’t. My faith is as it was before, probably a little bit stronger. react to my transition. I met with my Rabbi who was understanding. He suggested that I make a fresh start at another local synagogue, which I did. The new community welcomed me warmly and I feel comfortable and accepted.